By taking a structured approach to critically examine how work is performed, we get unvarnished insight into how we do things today. In so doing, we are more likely to align organisational objectives – efficiency through re-use, creativity from collaboration – with day-to-day work. This gives us an indication of the extent to which we have an aptitude for innovation. As a result, a focus on innovation is less of a hope-based initiative, and more of a fact-based exercise. 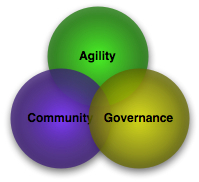 That said, if we are to critically look at things we do to facilitate – or, for that matter, stifle – innovation, we first must understand in greater detail the elements of Agility, Community and Governance. The organisation develops a culture that values and rewards continuous learning and fast failures. We also recognise that the cost of change – that is, the extent to which we are able to accommodate change with minimum disruption – is a contributing factor to our ability to produce and consume ideas and code. 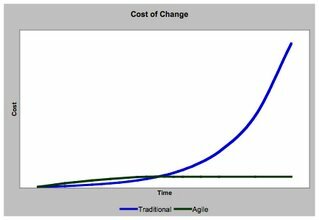 Traditional ways of working have an exponential cost of change: design decisions, taken in early stages of a project, have long horizons. It becomes increasingly expensive to change course as we get further into a project as code is highly coupled to this set of decisions. Simplicity of design and well-defined services are preferred over big up-front design or coarsely- or finely- grained functions. Robust testing – in the form of programmer-written unit tests and QA-written functional tests – in conjunction with continuous integration, makes “development complete” less a matter of opinion, and more a matter of fact. For purposes of critically analysing our day-to-day practices we will look at these a bit differently, but for now this list allows us to understand in context how we deliver – and how we would like to deliver – IT solutions. Traditional ways of working to the letter of a contract and suffering under the weight of rigid change controls must give way to commercial contracts that facilitate constant assessment of project variables – quality, time, resources and scope – in pursuit of meeting evolving business. This is not to say that these practices are mandatory for innovation and we don’t look to these as elements of compliance or certification of an “innovative enterprise.” We do, however, recognise that these are things that systematically and synergistically incite innovation: if we have strong Community, a high degree of responsiveness and mature Governance we will be more inclined to innovate than if we have a weak community, long-term decision lock-in, and limited means by which to oversight IT results and activity.